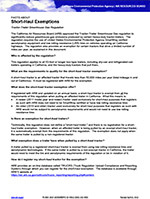 Starting in 2020, the California Department of Motor Vehicles (DMV) begins compliance verification to ensure that vehicles subject to the California Air Resources Board’s (CARB) Truck and Bus Regulation meet the requirements prior to obtaining DMV registration. 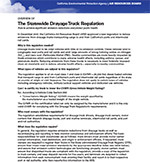 All owners of diesel trucks, buses, trailers and transport refrigeration units, or "reefers," that operate in California, are required to take steps to reduce air pollution. Reducing emissions from existing equipment is necessary to meet federally imposed clean air standards and to reduce the adverse health effects from pollution. 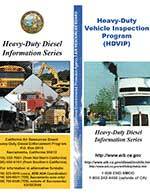 On December 12, 2008, the California Air Resources Board (ARB/Board) approved the Truck and Bus regulation to significantly reduce particulate matter, or PM, and oxides of nitrogen emissions from existing diesel vehicles operating in California. School buses have different low-use requirements. 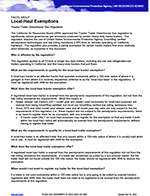 This summary describes how to obtain a certificate of reporting and how brokers, motor carriers, contractors, public agencies, developers, and other dispatching or hiring entities must verify the fleets they hire or dispatch are in compliance with the Truck and Bus regulation (regulation). 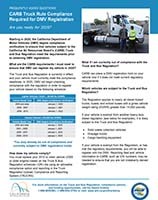 The regulation applies primarily to owners of 53-foot or longer box-type trailers, including both dry-van and refrigerated-van trailers, and owners of the heavy-duty tractors that pull them on California highways. These owners are responsible for replacing or retrofitting their affected vehicles with compliant aerodynamic technologies and low rolling resistance tires. This regulation applies to all 53-foot or longer box-type trailers, including dry-van and refrigerated-van trailers operating in California, and the heavy-duty tractors that pull them. Recent amendments to the regulation now exempt 2014 model year and newer heavy-duty tractors from the requirements of this regulation, since they must meet requirements of the federal Heavy-Duty Greenhouse Gas regulations. Vehicles that operate exclusively in areas defined as NOx Exempt Areas can meet PM filter requirements on a delayed schedule from 2015 to 2020 and do not need to be replaced after they are equipped with PM filters. 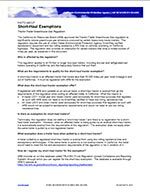 Each January, or within 30 days of purchasing a vehicle, owners must report fleet information and to identify which vehicles will operate in NOx Exempt Areas to take advantage of the extensions. The California Air Resources Board (ARB) approved the Tractor-Trailer Greenhouse Gas regulation to significantly reduce greenhouse gas emissions produced by certain heavy-duty tractor-trailers. The regulation requires the use of U.S. Environmental Protection Agency SmartWay verified aerodynamic technologies and low rolling resistance (LRR) tires on vehicles operating on California highways. 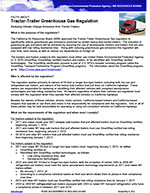 In December 2007, the California Air Resources Board (ARB) approved a new regulation to reduce emissions from drayage trucks transporting cargo to and from California’s ports and intermodal rail yards. Dray-off is when a container, cargo, chassis, etc., is transferred from a compliant drayage truck to a non-compliant drayage truck. Both the truck owner and motor carrier are subject to substantial fines for dispatching or operating non-compliant drayage trucks. Only two percent of California’s vehicles are heavy-duty vehicles, but they produce about 30% of nitrogen oxides (a key smog forming compound) and about 65% of particulate matter (soot) emissions from motor vehicles. 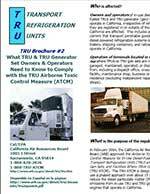 What TRU & TRU Generator Set Owners & Operators Need to Know to Comply with the TRU Airborne Toxic Control Measure (ATCM). Idling diesel trucks and buses create toxic air pollution, contribute to global warming, and waste costly fuel - and in some cases, the operator may be breaking the law. Find out how you can help keep emissions in check so we can all breathe easier.